Digital art used to be something you could only do on a desktop with expensive software and equipment(read: drawing tablets). But with so many awesome art apps out there you can create incredible artwork on your smartphone, tablet, or even in your web browser. Actually one of the best ways to do this is with free browser-based apps. Most of these work best with a Wacom tablet and stylus, but you can also go a long way with a mouse or trackpad if you have patience. Play around with a few of these and see which ones may fit best for your workflow. You’ll be surprised how much artwork you can actually make with these! Sketchpad is fairly intuitive and simple to use, even if you’ve never used an app to create art before. 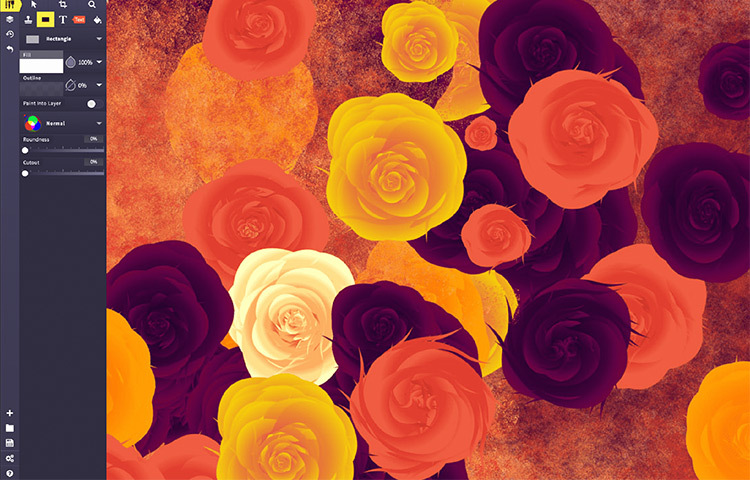 You’ll get a basic set of tools and brushes like adjustable pencils, stamps, text tools, clipart, and lines with snapping capabilities and layers. You can keep things really basic, or use the tools to their fullest potential to create some seriously cool stuff. Mostly anyone would love the clean, intuitive layout because it’s super quick and easy to access with all your tools, no matter what type of tech you’re using. 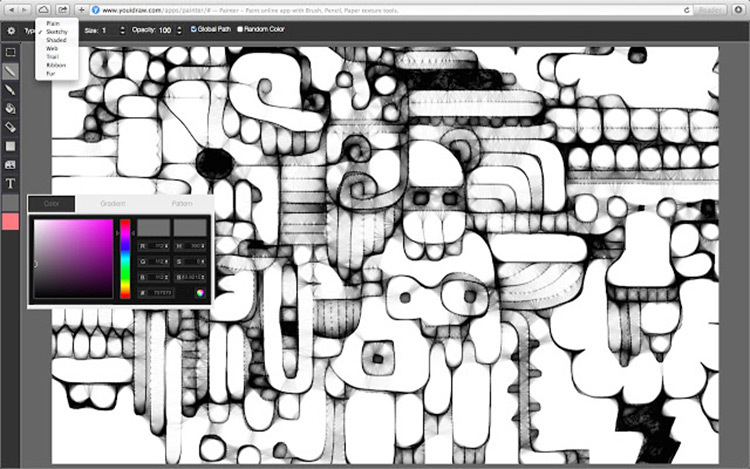 Sketchpad might not be the tool for creating highly detailed finished pieces. In fact I’m almost sure it’s not. But it’s a great way to dip your toes into digital drawing and get used to using a webapp. Unlike a lot of the other apps on this list, YouiDraw has been around for a while. It’s great for drawing, along with creating designs like logos and maybe some basic icons. This app has lots of features to explore, so you can get as simple or as complex as you want. You can start by drawing on a blank page or by uploading an image to manipulate. YouiDraw works a bit differently from most apps and programs, but it’s actually really cool when you get the hang of it. 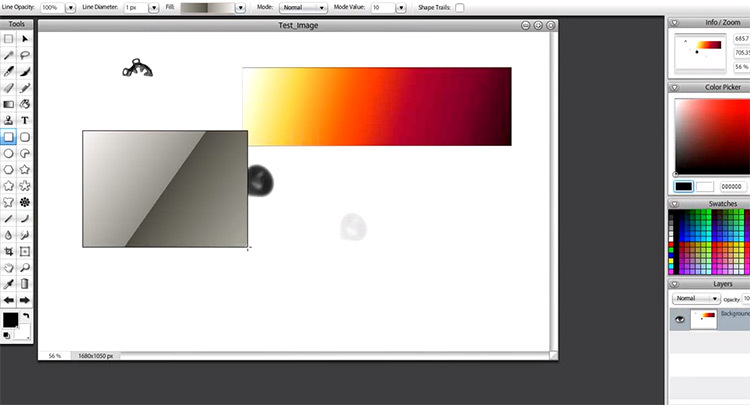 Most digital art programs use layers as a way to organize the elements in your piece. YouiDraw uses not only layers but pathways too. Don’t worry, you still have layers here. But each element you put on your canvas is also its own “path” that you can edit and manipulate on its own. This takes some getting used to. But you might find pathways even easier than layers! Once you get a grip on pathways and learn not to get lost you’ll love what you can do with this app. With Pixlr you can also draw or modify images just like you would with Photoshop. Start with a fresh canvas to draw or paint on, or upload an image from your computer if you’d rather start that way. You’ll find a lot of tools similar to what you’d get in Photoshop with many of the same capabilities. So this is great if you just don’t want to shell out for Photoshop. Still, this isn’t a real replacement for desktop drawing software. And this might not be the best for total beginners learning digital art, but those with some experience can jump right in easy peasy. This app is so fun because it’s meant to be collaborative. So you can create art with other people around the world! Several artists can all open the same file and work on it at once, which is pretty darn cool I think. This is great for brainstorming on projects, or for creating fun artworks and goofing around. The app is fairly new so it’s changing all the time and frequently getting new features. But you can already do quite a bit with it. Note: since it’s under construction though, the creators advise you to save work frequently. Unlike a lot of these other apps, you can use stylus pressure with Aggie although quality varies from browser to browser. Aggie has lots of tool settings and capabilities, but it does pretty much anything you can expect from a drawing program. If the collaborative aspect appeals to you, well here’s your app. Sumopaint is a popular webapp for creating and sharing artwork because it comes with a community of other artists. 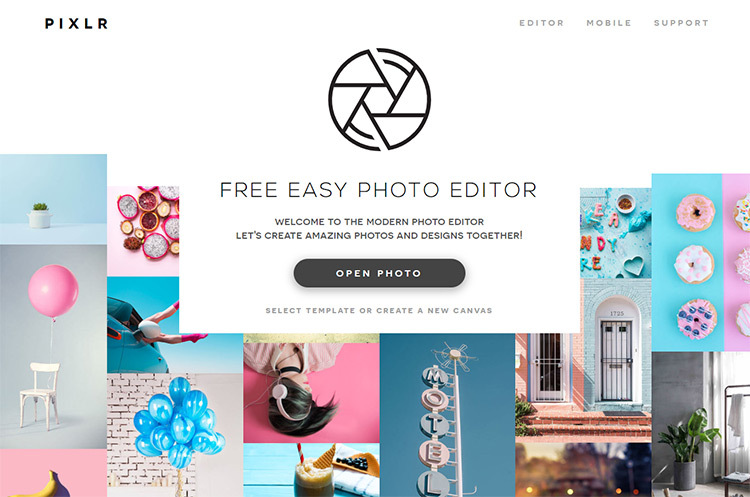 Here you can share artwork, collaborate, and learn from each other. You can even use it offline! The app comes with perspective tools, a huge variety of adjustable 2D and 3D brushes, layer capabilities, stamping and cloning tools, and so much more. In other words: this app is wildly popular for a reason. You can draw and paint an original piece from scratch or edit photos all with this one simple web-based tool. It’s worth noting they do have a pro version but I’m not sure what that offers extra. After toying around with this a bit though, I’d say the free version is plenty. Here’s a very simple app to get you up and drawing in no time. It’s a neat little webapp to help beginners get used to the basic tools you’ll find in almost any art program. Kleki has a simple layout that you can figure out in minutes, even if you’re a digital drawing newbie. You won’t find as many tools here as you will in some of these other apps, but Kleki is great for drawing and sketching ideas fast. It’s perfect if you don’t need a lot of detail in your work. Also for newcomers who just want to create simple drawings or comics, or just get used to creating art in this digital format. While it might not be the program for elaborate finished pieces, you can do quite a bit with these simple tools and a little creativity. In fact, sometimes simplicity opens to the door to even more creativity because it forces you to use limited tools in a new way. 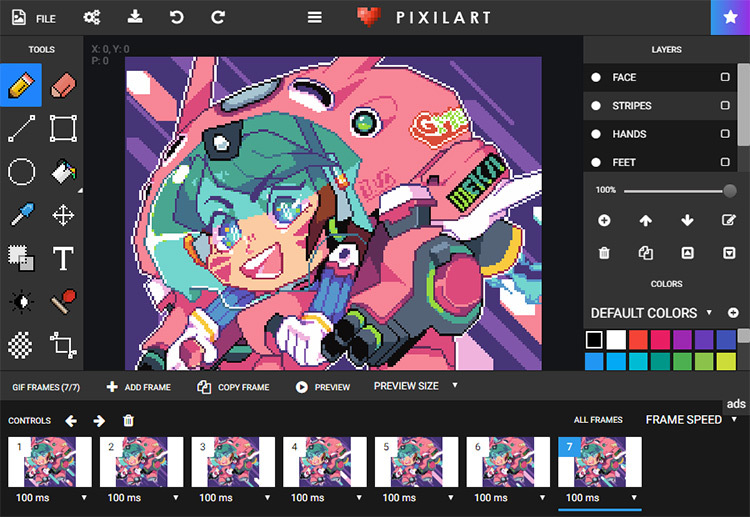 Not to be confused with the Pixlr editor app mentioned earlier, this program is specifically for creating pixel art. You know, the stuff you’d see in old 8-bit or 16-bit video games. You’ll find a lot of the same tools here that you’d find in any drawing program like brushes, a paint bucket, color picker, text, and stamp. Just that everything is pixelated. If this is your style well here’s your webapp! It’s a lot of fun to play with if you’re experienced or if you’ve never tried this art style before. It definitely doesn’t do a lot of things, but it does do pixel art really really well. Worth playing around with if you’re into pixel art or 2D game design. 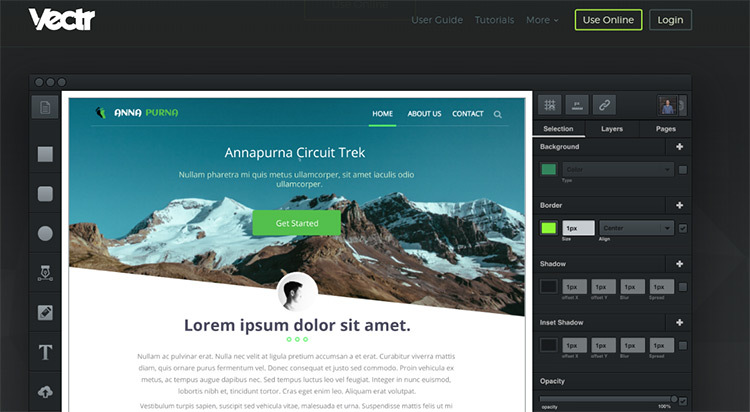 Vectr is an intuitive graphic design tool created to shorten the learning curve and help designers create some amazing stuff fast. This app isn’t really meant for painting and drawing, but rather for creating graphic designs like logos, icons, slideshows, or maybe small vector graphics. Given the name you can probably guess this webapp only creates vector files. 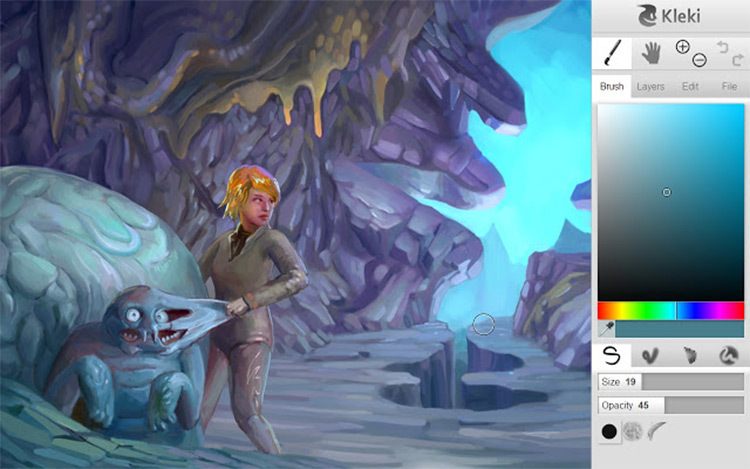 So if you do create some artwork here you can scale it out to massive sizes while still maintaining image quality. If you’re interested in graphic design definitely try this out! With this one app you can easily create professional quality images or icons while still feeling like an artist. One of the cool things about Vectr(besides being free) is that you can collaborate with others in real time. Other designers can watch you draw live(and you can watch them) which is great for teaching and learning. It also comes with tons of free tutorials right on the site so you can start learning immediately. This app is actually a bunch of drawing games like Pictionary, as well as drawing contests and challenges all rolled into one thing. If you just feel like drawing you can open a blank canvas and get started here. But the interactive stuff adds another layer on the site. Games can actually improve your drawing skills if you practice the right ones. Some of them require you to draw quickly instead of overthinking things. And the “it’s just a game” mindset can remove a lot of the mental pressure we put on ourselves when we’re creating art, opening us up to more freedom to express creative ideas. LetsDraw.it is a lot of fun and a great way to get used to drawing on a computer. It’s simple to get started and intuitive to pick up. 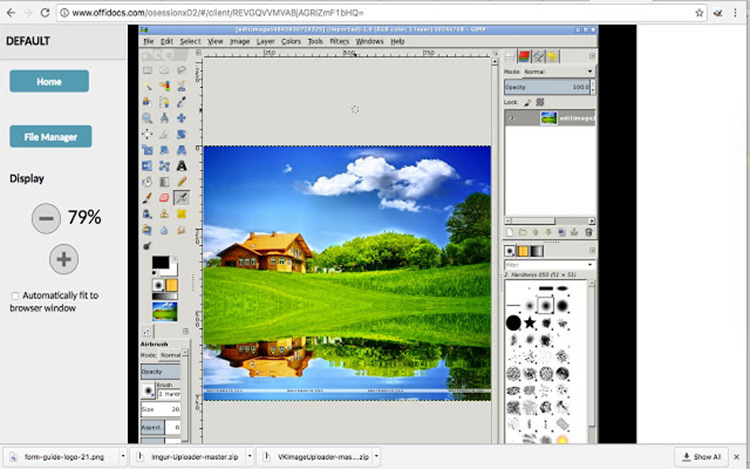 As you probably gathered from the name, this browser extension/webapp is an online pared-down version of the popular digital graphics software GIMP. It does have a bit of a learning curve, but once you get the hang of it you can create truly stunning work. In fact it might have the most capabilities out of any webapp on this list. You can do a lot or a little with this sucker. Draw and create original artwork, manipulate images, and retouch photos. So many possibilities! This might not the best choice for total beginners, but if you’ve used GIMP before or are semi-experienced with digital art you’ll love this thing. This is actually a drawing game and AI experiment, and it’s lots of fun! You’re basically playing Pictionary with a machine. 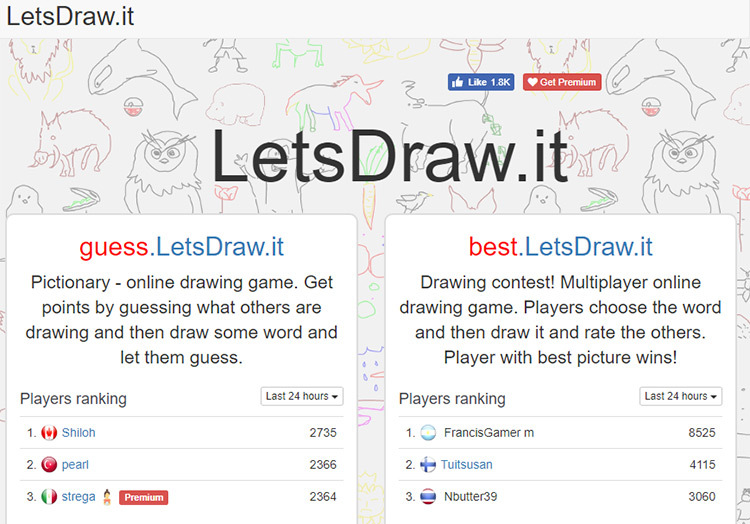 You draw and it guesses what you’re drawing, and it learns as you go because it remembers not only your drawings, but those of everyone else who uses it. This game is crazy smart and it’s always getting smarter. Not only will you get to play a fun game and hone your drawing skills, your drawings will also go into the program’s database where they’ll contribute to further AI research. 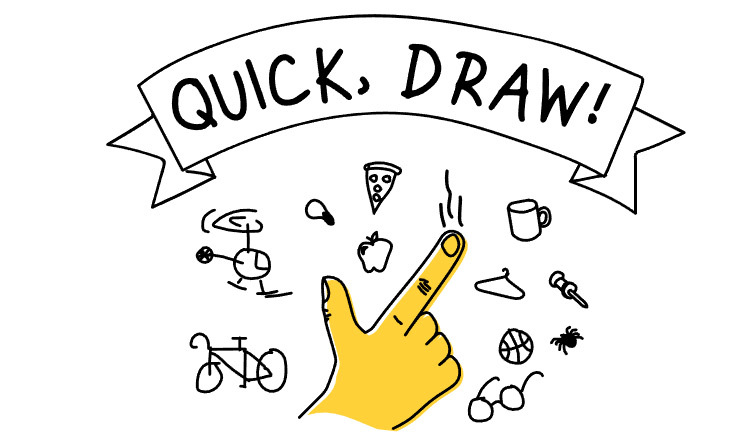 Google Quick Draw is perfect for doodlers, Pictionary enthusiasts, AI nerds, and anyone who wants to kill a little time playing with a really brainy art machine.